Litmanen, Davids, Overmars, Kluivert, the de Boer brothers, Blind and Rijkaard. It is astonishing to think that Ajax team fifteen years ago contained such talented football players in their first eleven. That’s without mention of their manager, Louis van Gaal, who has since managed some of the largest football institutions in the world. 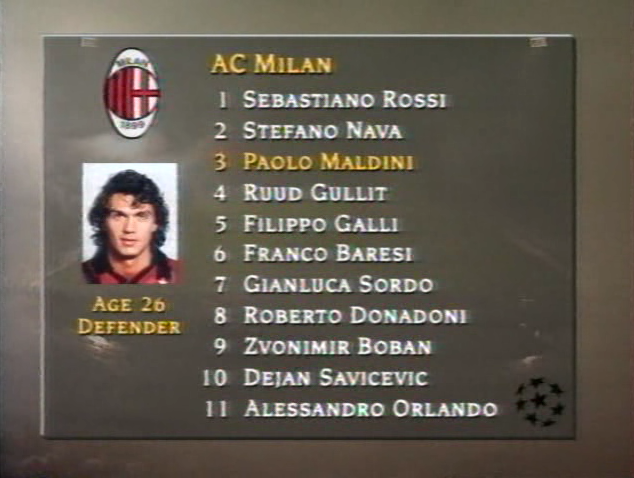 Up against them were names such as Gullit, Baresi, Maldini, Donadoni, Boban and Savićević. Manager of the Rossineri was Fabio Capello, who had been the mastermind behind Milan’s 4-0 defeat of Johan Cruyff’s FC Barcelona in the 93-94 Champions League Final. Ajax’s team contained a mixture of experience and enthusiastic youth. Backing up this eclectic, exciting mix of footballers was a man with a distinct philosophy that broke the hum-drum of football in the mid 90’s, harking back to the romanticised eras of yester-year. Eras where a distinctive style of unknown football could fester, creating an aura around a team of expectation and authenticity. Such feelings and emotions would not been felt now due to the globalisation of football and the ease of which we can access football from all around the globe. Admittedly, the thought of analysing and dissecting a mythical and much-loved football team makes me somewhat disgusted. Part of the magic, as with many retro-ideals and retroscapes comes from the emotions (sometimes incorrect) and images such footage and imagery evokes. Nowadays the first match of the group stages in the premium European competition is usually a predictable affair, accompanied with a pretty bland atmosphere. In the Olympisch Stadium, this wasn’t the case. With the players entering the stadium, the camera follows them, stumbling behind, struggling to catch up. In the dingy subway-like tunnel, graffiti adorns the powder yellow bricks, a simple slogan of ‘Ajax’ is scratched into the walls. When the players enter the stadium, flares are a lit and the pitch is covered in a smoky haze commonplace in media- ostracised regions of European football. Ajax lined-up with two lightening quick wingers in Overmars and Finidi George patrolling each flank with the intelligent and technically superb and mulleted Jari Litmanen behind the youthful Kluivert. Van Gaal packed the midfield with de Boer, Davids and Frank Rijkaard protecting the back-three of Reizeger, the de Boer of the Frank variety and Danny Blind. Capello, that heartless, prison-warden of a manager played his rigid, dogmatic 4-4-2 that he pushes down the throat of each player of every team he manages – what a cold brute. Louis van Gaal’s Ajax side operated with Danny Blind as a sweeper. Pre-historic as it seems today, playing a sweeper helped negate Milan’s threat in the attacking third. With Gullit and Dejan Savićević being picked up by Reizeger and the stouter de Boer brother – this left Blind to pick up stray balls, runs from deep and anything Milan threw at him. Ajax were comfortable in having 3 defenders against 2 attackers, de Boer and Reizeger looked comfortable picking up a forward each and if they failed to control the Rossoneri forward line, Blind was the contingency plan. From the off, Capello realised that he needed to get his wide players into the game to breach the narrow Ajax defence. With an obvious ploy to breach the Ajax defence, it was up to van Gaal to react to this. Ajax responded by getting Davids and R. De Boer to track the wingers back, and did so wonderfully. When they did this, Jari Litmanen dropped deeper to fill in the central midfield so the deeper lying Frank Rijkaard was not outnumbered in the middle of the field. This blog has mentioned when faced with doubling-up, switching the ball quickly and directly can lead to a team finding an area of the pitch with no opposition player in. Such tactical nuances were a distinct part of this Ajax team. 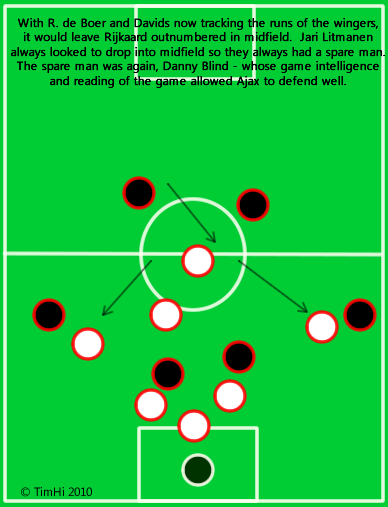 This is an obvious and logical tactical ploy; however, some Dutch people did not find this logical style of play attractive or in keeping with Dutch flair – as it often meant that talented players like Marc Overmars were instructed to play a pass instead of attempting to pass his marker. Regardless of national opinion to such regulated thought processes in regard to talented, individualistic players – the tactics worked. The quick movement to an area where Milan were a man-short allowed them to keep possession comfortably as well as creating opportunities. This match however runs eerily similar to England games against opposition at the World Cup. 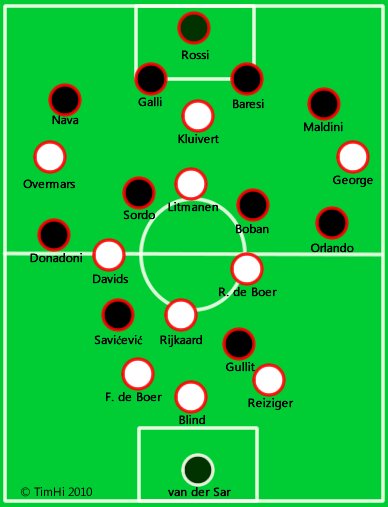 Milan’s use of a rigid three-bank system, based on strict straight lines gave Ajax the opportunity to find space in the most predictable of positions on the pitch. Rijkaard and Litmanen were always available to receive the ball, dissecting the Milan midfield with ease. Ajax’s flexible, hard-working 3-1-2-3-1 system allowed Ajax to have a spare-man available when Milan had the ball, but significantly, it gave flexibility and strength in keeping possession. With Rijkaard and Litmanen both floating around the half-way line and attacking third respectively, Ajax were able to move the ball with ease. The rigidness of the 4-4-2 made it difficult for Milan to react to these players, as if they did move out of position to get closer to Litmanen and Rijkaard, the shape of the team would have fallen apart. To combat the constant space Litmanen was receiving, Donadoni found himself moving infield. This however gave the slick-haired and slick-heeled Overmars more space to receive the ball. The use of Davids and de Boer is interesting too. As well as having defensive responsibilities, they were instructed to run from deep to connect with the wingers and forwards. It was their late runs that were most dangerous to penetrate the Milan high-line in the first-half. To do this, both Davids and de Boer had to have superb tactical understanding and discipline, not to mention supreme physical fitness. The combination of quick passing and runs from deep were a constant menace for the Milan back-line. The implication of this was the high-line played, used to combat the threat of Litmanen, dropped deeper and deeper to negate the threat of these quick triangles through the midfield. Ajax were always stretching the Rossoneri defence with Overmars and George always looking to stay wide in the build-up of moves. 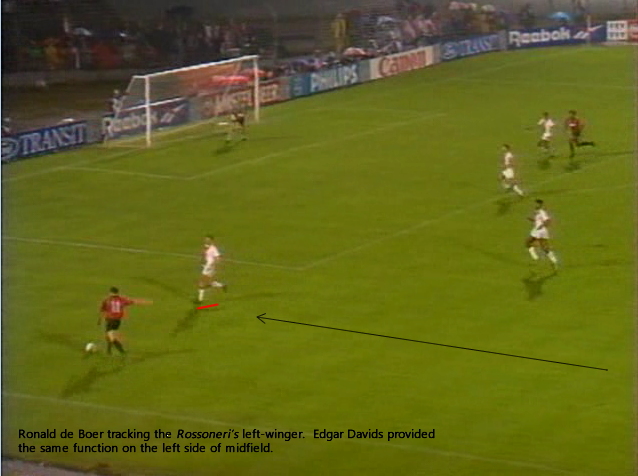 It was therefore unsurprising that either Davids or de Boer would be the one to break the deadlock in this game. Rijkaard plays the ball to R. de Boer who wanders off his marker, turns and look for a forward ball. With George keeping the Milan defence stretched, a pass through to Kluivert is on the cards. de Boer follows his pass and looks to run between the centre and full-back. Kluivert turns and returns the favour to de Boer who, with the outside of his right-boot, places it into the net. This Ajax team should have left a long-lasting legacy; it had the players, had the system and had the manager in place to succeed for a long time. The players they had were young yet they had game intelligence instilled inside them. The system was flexible, always allowing Ajax to have a men-over in all areas of the pitch. In a typically Dutch fashion, this team was not well-loved by the Dutch people, as it restricted individualism and spontaneous creativity. As a collective however, the team were phenomenally well-drilled and creative, the system formed a base for players to play aesthetically delightful football as a team. It is a shame that the Bosman ruling decimated this team, sending the majority of players onto bigger clubs for lesser fees than what would have been demanded. Their last act together, however, was beating this same Milan side in the Final – a small chapter in a story of what could have been. Fascinating stuff. Really enjoyed that. Have you read The Coaching Philosophies of Louis van Gaal and the Ajax Coaches? I think regardless of what van Gaal is a genius, in the right circumstances. I’ve read bits and pieces about van Gaal, mostly from Brilliant Orange. I think he is too, he’s a fantastic coach, really drills routine and tactical understanding into his teams. It’s really interesting to read more into the history of the game, I like the connections with the current situation re: Capello – looking running themes is so helpful in understanding the development of different managers throughout their careers. I think Chile play a similar system with wingbacks who can become central midfielders when needed (obviously the systems are not identical). I always wondered how Ajax got away with having such a narrow defense. Thanks for the education. Did Reizeger and F.De Boer become fullbacks when Rijkaard dropped into defense to form a 4 man defense or did that never happen ? Reizeger and F. de Boer didn’t become full-backs at all, they always played centrally or in the channels. Any defending outside them came from Davids and R. de Boer – really remarkable given how far forward they found themselves. Cracking read. It’s refreshing to read about the tactical approach to a game which at the time I’d never thought of (I was but 11 when this game was played). 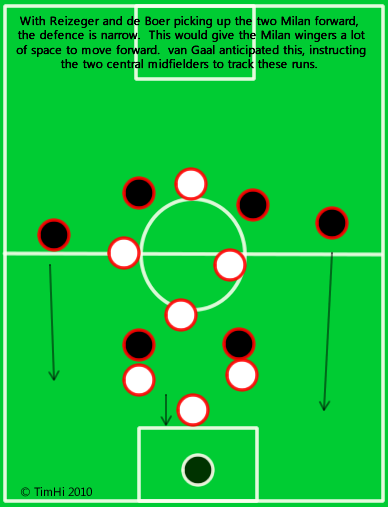 The principle of keeping 3 at the back reminds me of the Zonal Marking article which features Bielsa’s idea of only needing one spare man, hence his back 3. I must have missed that article by Jonathon Wilson. Thanks for that, really interesting read. I’ve been a fan of a back 3 for as far back as I can remember but am aware that it hasn’t had much success at the highest level. Enjoyed this piece a great deal as it shows that it can be done with the right personnel and feel sorry for Ajax, the timing of the Bosman deal really hurt them, I doubt if any club has suffered because of it as much as them. Brilliant article. I was fortunate to go to a week-long coaching course with Gerard van der Lem and Franz Hoek shortly after they won the cup. Awesome insight into their system from the planning all the way to the specific exercises on the training pitch. What would be really interesting for a future article would be an analysis of the evolution of van Gaal’s tactics from Ajax to Barcelona to AZ to, finally, Bayern – what’s changed and what’s stayed the same. Really fantastic stuff, as ever, Tim. Nothing to add – I’ve always loved Ajax. Captivating and very insightful read. Enjoyed immensely and keep them coming. 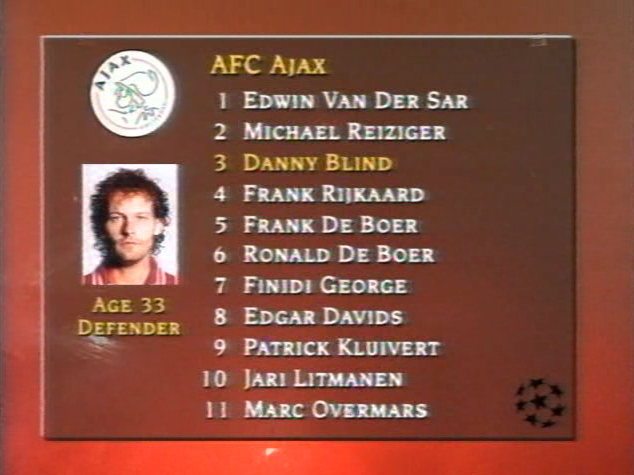 Ajax had a great team in the early and mid 90s. But when I read about sweepers and 5 man defence (I know it was a tactical trick), i feel unwell. But the attacking team of Ajax was great and the mid 90s were different times. But to come to ‘analysing and dissecting a mythical and much-loved football team’, I share your feelings. When is see the 4-0 of Milan over Barca I see three goal after big individual failures from the Barca defence. Or a nother game: Ajax – Inter 1972 the first goal was a failure from Frustalupi losing the ball in front of the Inter goal. Maybe because of ‘pressing’ but … not pressing like we know it today. But that’s the way, different times and different style. 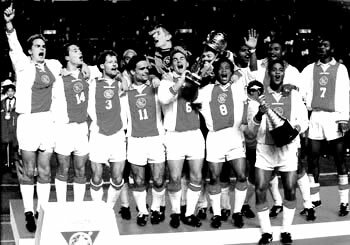 Ajax was a great team (in 95 and 72). One point worth mentioning is that in the first two games, Milan couldn’t count on many starters and was forced to field a few players that were far from talented. Playing Sordo in midfield meant that it was really hard to keep the team tight: that was the legacy of Sacchi that Capello stayed loyal to, and if executed if would have left little space between the line. In the final Milan recovered some of its starters (but again, not enough of them), making for a more balanced game. Very nice article. I have to remark though that the team really only began to fall apart after the 1995-1996 season, when Reiziger, Davids, Overmars, and Finidi left; in the eyes of the Dutch, their best performance was actually the 2-0 defeat of Real Madrid at Santiago Bernabeu in the winter of 1995, when they got a round of applause from the Real fans at the end of the match. Great article, congrats, this system was used only at the final game or it was a constant during that Ajax era?